Now that Tsukuyumi: Full Moon Down has launched on Kickstarter, we here at the Gumbo would like to provide some insight into a game that we’ve been playing quite a bit of down here in Louisiana. First we’d like to introduce you to a few of our contributors so you can better understand the games that we like to play. Then we’ll do a short review on how the game is actually played. Tsukuyumi is a difficult game to review since the unique powers and abilities of the factions play such a large role in the game. To do the game true justice you would have to go through each faction so that players could truly understand how each one plays differently from the others, so instead of doing a full review we are just going to do a review of the basic mechanics of the game. If you’re interested in the flavor of each faction then you can find tons of information about them on the Kickstarter campaign itself, or simply ask us about your favorite faction. Lastly we will provide a critique of the game from the various viewpoints of our contributors; find out why they like the game, any concerns they have with it, and what games they readily compare it to. Maybe through all of this you’ll find some information that will help you make an informed decision on whether or not to join in on the Kickstarter campaign for Tsukuyumi: Full Moon Down. Just a short note before we begin; all of our plays of Tsukuyumi have been with the standee version of the game that was released by King Racoon Games. Because of that we can’t speak of the quality of the miniatures from Grey Fox Games’ version. However, we did do a review of another Grey Fox Game earlier this year, War of the Worlds: The New Wave. Based on the quality of the miniatures in that game, there shouldn’t be any cause for concern. BJ is the editor of Board Game Gumbo and loves one hour wonders in all shapes and forms. His favorite games are usually thematic worker placement games, but he loves challenging his wife in tile laying games or two player card games, too. 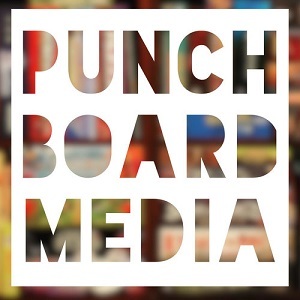 He has a voracious appetite for board game content, in written or audio form, and dreams that someday he will finish a legacy or campaign game that he started. Bradly is an Omnigamer and will literally play any game he has not played before. However, his interests lean toward games with open-ended scoring; Western Legends and Lords of Hellas would be examples of these types of games, where players can win while playing the game in different ways. He also particularly enjoys games with asymmetry between players, whether it is built into the game, as in VAST, or players become asymmetrical through play, such as in Blood Rage. Carlos would like you to know that he is not a cylon (but really, he is). Most of what you’ve heard about him is just lies and slander. It’s totally safe to give him your Executive Order card. Carlos is most at home playing any game with a lot of player interaction, and especially those with hidden roles or traitor mechanics. Zack enjoys solo games and thinky euros, but he also dedicates a lot of time to two player games. He also likes games that try to do something different or bring new mechanics into stagnant genres; to that end he tends to get his hands on a lot of indie, or small publisher, games. Tsukuyumi is an area control game, and almost as pure a representation of that mechanic as you will find. Unlike a game like Ethnos, which pairs area control with set collection, there is very little to do in Tsukuyumi that does not directly relate to controlling the various tiles that comprise the game’s board. Victory is almost purely derived from the tiles you have under your control at the end of the game, with few additional scoring options. 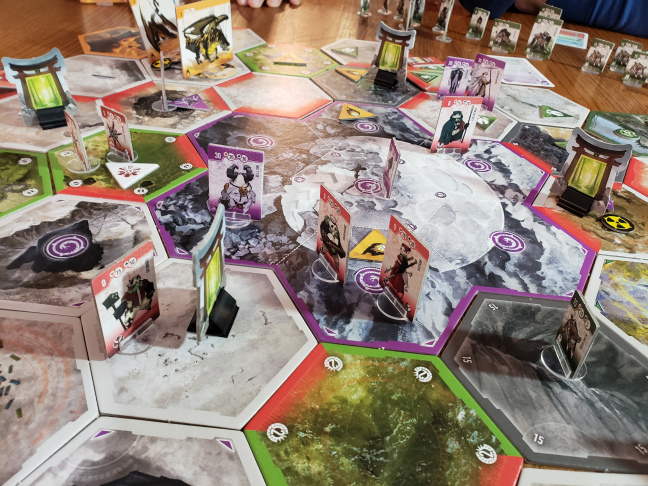 This does depend largely on what faction you are playing, however, since The Sentinels instantly win the game when they eliminate all Oni from the board. You can teach the basics of Tsukuyumi in a fairly short amount of time, probably only 10 or 15 minutes. The basic round structure is actually fairly simple, with the true complexity of the game coming from the severe asymmetry between the different factions. Every faction has their own collection of units with their own stats (health, damage and conquest values) and a specific cost. Each faction also has a unique set of combat cards, a special goal that only they can achieve, and a mission card that is used only when they are involved in the game but that each faction can achieve while playing. Most factions also have a special ‘Faction Effect,’ which can do anything from adding modifications to the tiles on the board, to allowing them to play additional Event cards. The Boarlords, for instance, have a Faction Effect that allows them to Terraform tiles on the board, making pathways that only they can cross or making those tiles more difficult for opposing factions to control. Each faction also has a unique Defense ability, such as the Boarlords’ Displacement ability. This is only triggered when the Boarlords are being attacked, but it allows them to move enemy units involved in that fight away from the area the battle just took place in. Tsukuyumi: Full Moon Down can be played in as few as 3 or as many as 5 rounds, depending on how long you want the game to run. Each round starts with each player drafting one of 6 Action cards dealt to them at the beginning of the game and then passing those cards to the player on their left. That one card will determine what actions that player takes, in initiative order, over the next 4 steps of the game; White, Blue, Green, and Red. At the end of the Red step players will score the round, and then go back to drafting one of the 5 cards they will have been handed by their neighbor. Play continues in this fashion for the length of the game, and then final scoring will happen. Let’s take a look at some of the action cards available to better explain how a round progresses. The three cards above are a good representation of what will be available during the game. The first card is what the backs of each Action card looks like, and becomes the options available to you in your White phase. On the other side of the cards are the actions you will take in your Blue, Green and Red phases, depending on which card you draft. Actions are taken by phases, so the first player in Initiative Order will take their White Phase actions, then the second player, etc. Once all white actions are taken, then the first player in Initiative order will take their Blue Phase actions, and so forth. You can take as much, or as little, of an action as you choose, so even if a card says ‘Move each of your units up to 1 area,’ you could choose not to move some of your units. The final card in the picture above is a rarity for the game, in that you are foregoing your actions in certain areas in order to get a much bigger action in one area. In this case, you forego your Blue and Red action phases in order to put out a lot of units in the Green phase. If you decided to play this card, you’d simply skip your Blue and Red action phases. If you selected the second card, we see what actions you will take during your Blue Phase (Moving your Initiative Marker and taking your Faction effect). As we’ve already discussed, what you do with your Faction ability is determined by what faction you are playing. Once all players take their Blue actions you’ll move onto your Green actions where you would Produce units up to a value of 2, and then Place any 2 Oni. Oni are the ‘bad guys’ and enemies to every player, and their actions are mandatory. By putting out Oni you can hamper your enemies from moving around the board or take away areas they control. Lastly, during the Red phase you would be able to move all your units 1 area and take 3 combat actions. Movement must come before Combat actions, but what you can do with Combat actions is also somewhat dependent on what Faction you are playing. Combat in Tsukuyumi is not all about destroying your enemies. After all, it’s an area control game, and fighting is not always in your best interests. Each faction has their own set of combat cards, so when you take a combat action you will decide which card you want to use. You hand that card to the player who you are targeting with your combat action, and they will select a response from that card. This explanation is best done with a visual aid, so let’s take a look at some combat cards. The first card is an Annihilation card, which means you are trying to damage your opponents in that area. 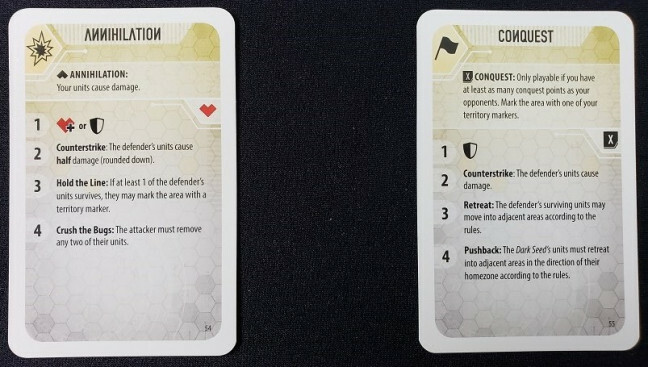 The second card is a Conquest card, so playing it will let you take control of an area assuming you have units there with a combined Conquest value greater than or equal to an enemy’s units there. But let’s say you want to eliminate some important enemy units, so you play the Annihilate card. You would hand that card to the player who you are attacking and they would select 1 of the 4 responses printed on the card. The heart and shield are defensive abilities unique to each faction, but if your opponent chose to they could activate those abilities in response to this card. Or they could choose to Counterstrike, dealing half of the damage their units would normally do back to your units. Because this is a Dark Seed combat card, one of the responses is called Crush the Bugs, which forces the attacking player to remove two Dark Seed units that participated in this attack. This usually isn’t a large concern for the Dark Seed, who typically flood the board with lots of weak units; destroying two of those units wouldn’t be a considerable loss for them. This is really all you need to know to understand how to play a game of Tsukuyumi: Full Moon Down. Players play 3 to 5 rounds wherein each round they draft a card that determines what they do during the 4 phases of each round. While there are several ways to score victory points, by far the most potent is control of tiles at the end of the game. The rest of the game comes from learning the ins and outs of each faction, and that’s not easy to do. The version we played has 9 factions of varying complexity, with each faction having different combat cards, unique powers, units, even special abilities. Bradly Says: If you like area control games like Blood Rage and Chaos in the Old World, I really can’t see why you wouldn’t like this one. The sheer amount of asymmetry in the factions can be daunting; I’d compare it to Chaos in the Old World, or perhaps Root, for just how different each faction feels from one another, but with 9 different factions to learn. This can lead to situations where a faction’s special ability completely derails your plans, simply because you didn’t think to prepare for it. However, it really only takes a single play with a faction, either piloting it yourself or just seeing it played by someone else, to understand it well enough to play against. Now mastering that faction will take considerable more plays, but I can’t speak to that. Of all the plays I have of this game, I have never played the same faction twice. They are all so interesting that I have felt compelled to try a new one each time. Faction unit cards that will come with the miniature version of the game. One of the concerns I have about the game is the addition of miniatures from Grey Fox. The standees provide a considerable amount of information about each unit; namely their Health, Attack, and Conquest values. Without them, players will have to go elsewhere for that information. Grey Fox’s solution is to provide a unit sheet that details the specific values of each unit. They have also designed the bases of each unit to give information on that unit’s health (triangle for under 5 health, circular for 10 or more, etc). The base idea is clever, but doesn’t truly solve the issue; circular seems to apply to anything from 10 to over 25 health. Also, I’m not in love with the faction sheet idea, but I would need to know more to make an informed decision. 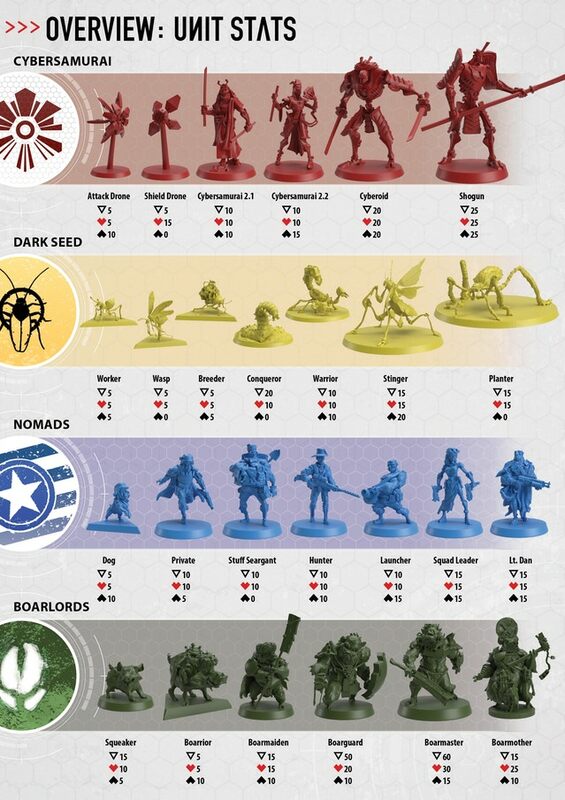 Will there only be one sheet for all factions, or will there be multiple to hand out around a game table? These are decisions that Grey Fox are still debating, so we don’t know for now. Personally I would love to see a sheet for each faction printed multiple times and included with the game to be handed out to the other players when you play that faction. We shall have to wait and see what decision Grey Fox makes on this. Ultimately I think I will have to wait until I’ve played the miniature version of the game to know if I will like it more than the standee version. Anyone who plays games with me will tell you that I am not immune to the lure of well executed miniatures. However, in a game like Tsukuyumi where there is so much information on the board to process, I find myself thinking that miniatures are not the way to go. Luckily for me, and perhaps others, King Racoon games is attempting to making standees alongside the new version of the game, albeit separately. So if you’re like me and think that standees are the better choice, head over to King Racoon’s Patreon page; if they can get a total of $1500 a month from donations they will be able to start printing standees for the game. Those standees will be provided free to anyone who is a patreon. Tsukuyumi is a game that takes the very best aspects of area control and condenses them so that, from the very start, you feel an incredible amount of urgency. The card play is also exceptionally well done, forcing each player to make difficult decisions each round on exactly what they want to do without knowing what options they will have for the next round of cards. The unique and interesting factions of the game truly elevate Tsukuyumi so that it feels like so much more than just moving pieces around a board. If we didn’t already have a copy of the game in our group, I’d probably be backing it myself. BJ Says: Start with a tight map and area control as your roux, add a dash of card play and combat, throw in a few pinches of bluffing and gamesmanship, and simmer with lots of juicy thematic content — that’s Tuskuyumi on your gaming table (although it could be a good brisket meatball stew, too). The designers have found a way to elevate the asymmetric ‘dudes on a map’ genre by overstuffing each faction with thematic elements. My Boarriors were more than just standees…they were my piggie clan brethren, completely focused on surviving a lunar disaster and a nuclear holocaust to protect the beloved BoarMother. Each opposing faction equally took on a life of its own during our games, making them tense and thinky at the same time. Tsukuyumi– a combat-and-conquest game that truly feels thematic! Carlos Says: Tsukuyumi is basically the NBA Jam version of Twilight Imperium. At their core, both games are about building up, clashing over scraps of prime real estate, and scoring whatever objectives you can as fast as you can. But while Twilight Imperium is a slow, churning warmachine with most early battles won through quick wit and silver-tongued diplomacy, Tsukuyumi cuts out all the chatty bits, slams a few Red Bulls, and lets you build friggin’ nukes on the very first turn. There are no Space Khajiit or Peace Turtles here; only Cyber-Samurai and Fireborn Dragons. I’ve heard there’s also a faction of tribal Boarlords in the game, but I only remember seeing plates of crispy bacon and a smoldering crater last time someone picked them. By far the coolest part of the game is how the card-based combat system works. Every faction has basic fighting and control cards (aptly named ANNIHILATION and CONQUEST because why not YELL EVERYTHING) along with a couple of faction-specific actions. The gimmick is that when you play the card to perform an action, you then hand it over to your opponent/victim so they can choose from a list of retaliatory options also printed on that same card. Obviously you’ll want to plan and maneuver your troops around the board in such a way that you get to smugly toss over your action card knowing that there’s not a single good option left for them to pick in defense. 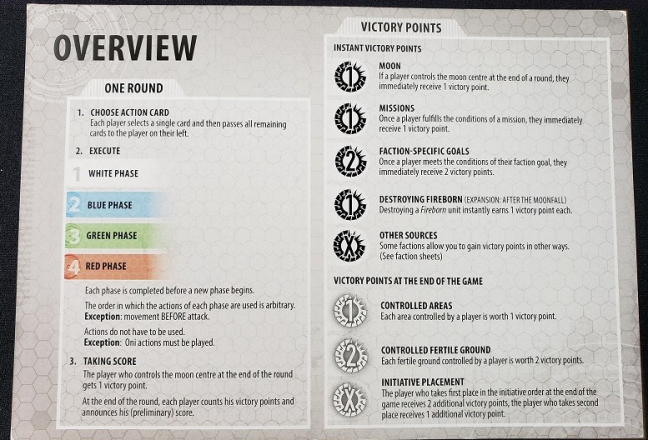 The other nifty feature is that each faction also contributes a unique scoring objective to the game that mirrors their own personality. My German-themed Gundam team wants to hunt down and kill moon critters… cool, now you do, too. This makes repeat plays quite spicy as your favorite faction might be shoved a bit out of their comfort zone to nab some of those juicy victory points your opponents are contributing to the cause. All in all, Tsukuyumi is an exciting and quirky twist on a game formula we’ve seen done plenty of times. While I still prefer working the long con and setting up a sudden, but inevitable betrayal in Twilight Imperium, Tsukuyumi delivers a tight, smash’n’grab dash for points in a fraction of the time. Zack Says: I’ve played as the Fireborn four times and never won, but that doesn’t stop me from wanting to keep playing them. The asymmetry in the game is excellent, and I appreciate how much has been abstracted away to make the unique factions as easy to learn and operate as possible. There’s no fiddling with 8 different kinds of resources in this game; every faction operates entirely on “production”. This lets you get right to the heart of a new faction almost immediately. The combat cards are by far my favorite mechanic in the game and I’m really fond of everyone controlling the Oni. If I have any negatives it’s that I feel like a little too much of the underlying game is abstracted. I’d be interested in more unique terrain or just more to chew on in general. It’s a game that puts the asymmetry of the factions first and I feel runs a bit too long for the game underneath it all. Personal preference aside it still is a fantastic experience and I’d happily lose as the dragons over and over. We hope this has provided those of you debating whether to jump into the Tsukuyumi: Full Moon Down Kickstarter with some useful information. Feel free to comment with any additional questions you have, or send them our way on Facebook or Twitter. – Until next time, laissez les bon temps rouler!